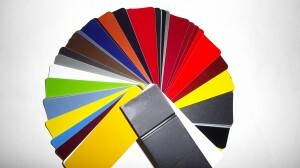 We are excited to announce the arrival of our new colour box, making it much easier to match colours. It’s a great backup to our powerful paint software program for looking up any vehicle’s colour code. Our new colour box consists of over 75 fan decks, containing more 4000 sprayed colour & variant chips, grouped by car manufacturer, it enables us to visualize the different variant shades of original car colours without making a spray out. Getting the colour right the first time will save us time, money and mistakes. How we match a vehicle’s colour starts from finding the paint code from the vehicle, usually on a plaque under the bonnet, sometimes in the door jam or even in the spare wheel well. Once we have found that code, it is entered into the computer to identify the colour. There are usually multiple variants of one colour and that is when our new colour box comes into play. Being told by the software that there are variants we are then sent to the colour box to identify the actual variant. After we have visually identified the coloured card against the vehicle body and confirmed the colour its time to mix. Telling the computer how much we actually want to mix, it gives us a formula where we can mix using all of our various tints in specific order to exact measurements. But what happens if the color has faded I hear you ask? No problem, we can still tint the color out to match the existing colour.